SUGGESTED USE: To assist the body in regulating an optimal acid /alkaline balance, stir one teaspoon of pH PERFECT™ into 6-8 ounces of pure water. Drink while it is still effervescing. For best results take in the evening before bedtime. 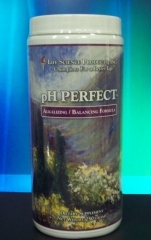 For especially high acid levels or relief of acid indigestion, pH PERFECT™ may also be taken anytime, as needed. CAUTION: As with any dietary supplement consult your healthcare practitioner before using pH PERFECT™ especially if you are pregnant, nursing, on a sodium restricted diet, or under medical supervision. Alkalizing ingredients can aid the body in providing “disease fighting” alkaline reserves. The term pH is a measurement of how “acid / alkaline” a substance is. When a body is too acidic, it can become a haven for unwanted viruses and bacteria. If these viruses and bacteria begin to flourish, they can mutate into more serious illness and diseases. Optimal health requires a slightly “alkaline” body. When the body is more neutral to slightly alkaline, it is extremely difficult for viruses and bacteria to take up residence, thrive and mutate. Alkalizing ingredients can aid the body in providing “disease fighting” alkaline reserves. There are no “ideal” numbers when checking the pH of morning urine, just observed ranges. Most Americans will test acid due to diet, lack of exercise, lifestyle, and stress. On a pH urine test range of 5.5 to 8.0, the 7.0 is more neutral to slightly alkaline. The closer you get to 8.0 the more alkaline your system will be. In today’s fast-changing world, we are constantly exposed to toxins, chemicals, and foods depleted of vital nutrients. Maintaining a healthy digestive tract is paramount to optimal immune function. Optimal immune function is paramount to good health.